GLOBAL A GO-GO: Staff Benda Bilili | Bouger Le Monde! Staff Benda Bilili is one of those bands whose back-story threatens to overshadow its music. 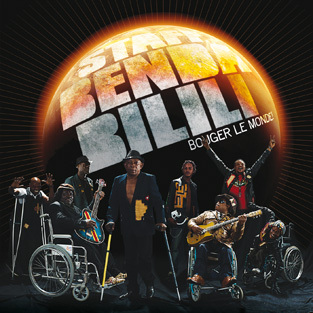 Benda Bilili’s core is four wheelchair-bound polio survivors who lived and started playing music together on the grounds of Kinshasa’s zoo. Their lead soloist Roger Landu, a former street child, plays an electrified one-stringed lute of his own design. Together they make a handy symbol of the Democratic Republic of the Congo (a country about the size of the USA east of the Mississippi) today: amazing human resilience and cultural adaptability in the face of war, plagues and the near complete collapse of government and civil society. But what of their music? Well, it’s quite wonderful – like a number of Kinshasa bands today, their playing looks back to the pre-soukous era, tapping directly into the Cuban rumba that originally inspired the first wave of Congolese superstars like Le Grand Kalle, Franco and Tabu Ley. Driven by multiple guitars, the rhythms are firm and driving, and Landu’s solos are twangy tours de force. 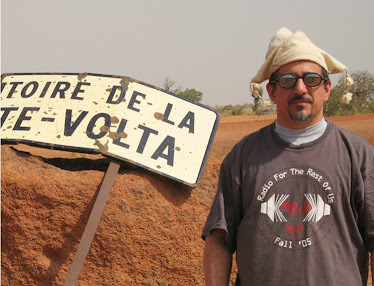 This is Central African roots music that rocks and is extremely accessible to the first-world listener – check it out.